With a bit of imagination, while sitting in a small classroom inside a bus, it was possible to contemplate the condition of European Jews crammed into a rail car on their way to certain death at – if not before – Auschwitz. Elena Kingsbury made it easier by telling a group of Thousand Islands Secondary School students the small area in which they sat would have seated some 400 or more people on one of the infamous Nazi rail transports, and a longer trip would start leading to deaths from dehydration, starvation or suffocation. 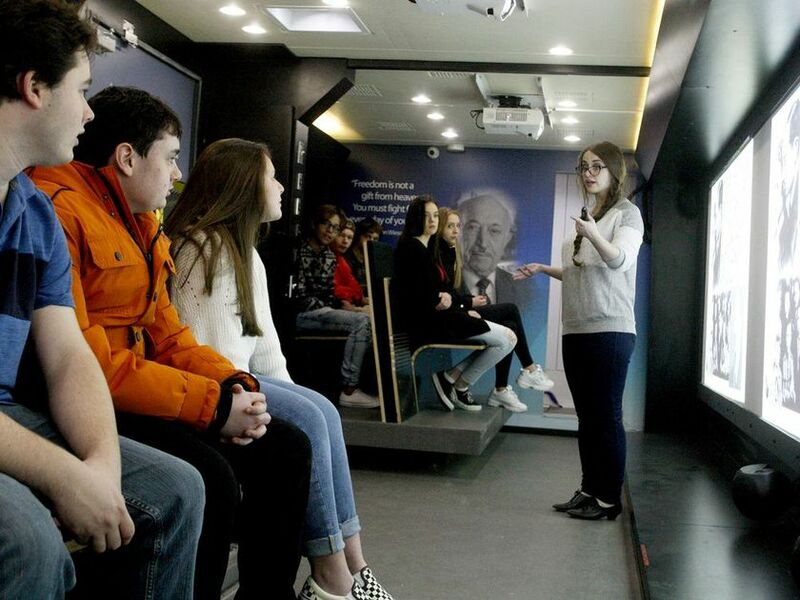 The local area native is an education associate with the Friends of Simon Wiesenthal Center for Holocaust Studies, which brought its Tour for Humanity bus to TISS on Monday. As its name suggests, the organization focuses a great deal on Holocaust education and countering anti-Semitism, but its efforts also touch on other human rights issues. “Basically, we talk about Canadian history as well,” said Kingsbury, whose presentation on Monday included the topics of slavery in colonial-era Canada, residential schools and the internment of Japanese Canadians in the Second World War. The Tour for Humanity bus, parked in front of TISS for the school day Monday, is currently on an Eastern Ontario and Quebec tour. Since its launch in 2013, the Tour for Humanity has visited more than 550 schools across Ontario, the organization stated in a media release. “The bus is on the road every day of the school year,” said Kingsbury. People familiar with TISS will not be surprised about its Brockville stop. Larry Henry, a longtime TISS teacher, was the 2017 recipient of the Arie van Mansum award from Carleton University’s Center for Holocaust Education and Scholarship, an award given out for exemplary work in Holocaust education. “He was the impetus,” said TISS principal Terry Gardiner, adding other teachers also came on board with the effort. “It aligns with our school philosophy, our board philosophy,” added Gardiner.